Heat the oil in a large non-reactive saucepan and fry the onions over a low heat for 10 minutes, or until very soft but not coloured. Add the garlic and ginger, and cook for a further 2-3 minutes. Increase the heat slightly and fry for a further 4-5 minutes, until the onions begin to brown, stirring constantly. Add the apricots, figs and raisins to the pan and cook for 2-3 minutes, or until the dried fruit begins to plump up a little. Sprinkle over the sugar, add the vinegar, spices and season to taste with salt and freshly ground black pepper. 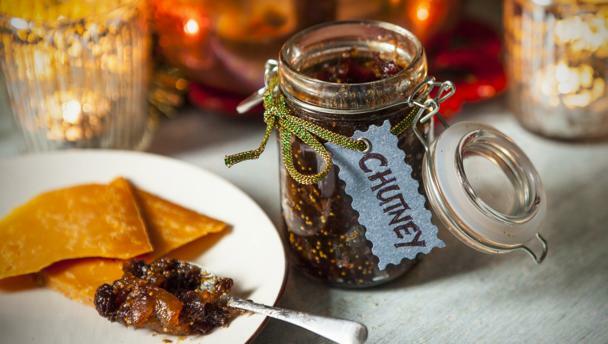 The chutney is ready when the liquid has reduced to just 4-5 tablespoons, and the fruit looks plump and glossy. Remove from the heat and set aside to cool. As the chutney cools stir it a little to distribute the moisture.